BioShock: The Collection is out now, bringing Rapture and Columbia into glorious high(er) definition. But the most important thing is that the collection includes the best BioShock title ever made: Minerva’s Den. It is a humble piece of downloadable content for BioShock 2 and it is damn near perfect. Before delving further, I offer a warning: there will be spoilers for the entire series. Examining Minerva’s Den requires looking at the series as a whole. To understand how it succeeds, we need to talk about how the other titles excel and fail. In Minerva’s Den, you play as a Big Daddy named Sigma. There is no grand quest to topple a tyrant like BioShock’s Andrew Ryan or “bring back the girl” like BioShock Infinite’s Elizabeth. You have one task: find the Thinker, a powerful computer made by the brilliant C. M. Porter, and get it to the surface. The stakes start low but become increasingly personal. One thing I’ve enjoyed about games like System Shock or BioShock is that they have a wonderful sense of place. You feel deeply and truly rooted in the world. Art design dazzles the senses while level design encouraging exploration asks you to see every single nook and cranny of the game world. Often, you revisit them. The spaces becomes familiar as you loop and journey through them. Minerva’s Den capitalizes on this particular strength by offering large sections of quiet travel. You begin the game outside the underwater city of Rapture and slowly walk your way back in. It takes a handful of minutes before you encounter your first enemy. The pace ebbs and flows between something contemplative and something frantic. Enemy encounters offer waves of splicers and you are given multiple tools to dispatch with them. The fights are furious and bloody but the halls in between are silent and full of self reflection. This is because Minerva’s Den is not just about the space. This is not Rapture’s story. BioShock already told that particular tale. This is C. M. Porter’s story. As a scientist, he worked with a partner named Reed Wahl to build a predictive computer that could run most of Rapture. This is the Thinker that you are trying to recover. Wahl is the game’s antagonist, greedily hoarding the Thinker’s knowledge for himself in a broken city. Porter is gone, long since betrayed by his partner and taken away by Andrew Ryan’s secret police. The soft silences of exploration belong to Porter. The mass violence and gunfights? Those belong to Wahl. The combat in Minerva’s Den leverages all of the intersecting systems from the first game and sequel with amazing effectiveness. These spaces are packed dense with turrets to hack, drones to dominate, splicers to hypnotize, and environmental hazards to turn against foes. 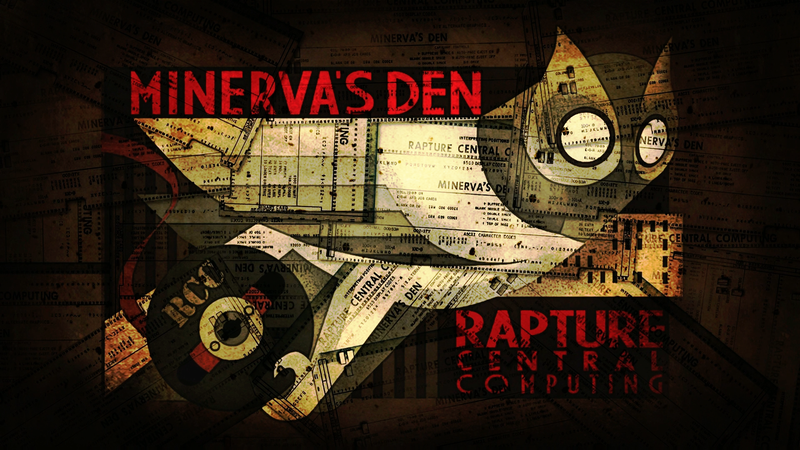 I’ve never felt more keenly away of BioShock’s moving parts than playing Minerva’s Den. It is an ecosystem that I can bend and use to my advantage. It is a realized world with rules that can be deviously broken. The combat of BioShock Infinite feels utterly laughable by comparison, partitioning players into arenas that offer minimal expression. Here? I need to understand the lay of land. I need to know where my hacked cameras are and where to place trip-mine like trap rivots. In BioShock Infinite, I dart about without care. I hardly know Columbia. But goddamn it, do I know Minerva’s Den. Better still, I know C. M. Porter. When I think of other titles in the series, I can certainly name personalities. I’ve heard lofty speeches from the arrogant, Randian Andrew Ryan and seen the possessive anger of collectivist Sophia Lamb. I watched with fear as Sander Cohen turned the still living into art and looked on with a smile as Elizabeth Comstock danced for the first time. These are windows into something larger but they are incomplete. With Porter, I get the full picture. I hear his sorrow at his wife’s passing. I listen to him reject the idea of splicing his black skin white so that he can avoid prejudice. His resolve and his anger and his genius are open to me. I care for Porter; I respect Porter. Meanwhile, I detest Booker DeWitt and fail to find any charisma in Andrew Ryan’s moralizing. This care is important. The came counts on it. The writing weaponizes it and turns it against you. You are C. M. Porter, transformed into a violent monster after Wahl’s betrayal. This is a different kind of twist than confronting Andrew Ryan in his office, unable to resist his commands as you bludgeon him to death. And it is not as grand as Elizabeth opening doors to infinity. BioShock and BioShock Infinite want to comment on games themselves. Players are mindless sheep! Game worlds have infinite potential and variables! These games want to impress you. Minerva’s Den wants to move you. There is no more fighting after this point. There is only a slow and terrible walk to the end of the game. It is one of those long, quiet moments. There is nothing left to do but accept who you are and move forward. You reach a bathysphere and rise to the surface. Porter learns to let go of his dead wife and the specters of Rapture. In BioShock, I was forced to endure a pithy morality system that said next to nothing. I walked through halls tinged with Objectivism that offered no real critique. In BioShock Infinite, I did a double take as a frustrated populist was treated with equal scorn as the white, racist theocrat that systemically oppressed her and countless others. I listened to long and ultimately pointless sermons on the nature of alternate realities and theoretical psychics. What those titles try and fail at, Minerva’s Den completely nails. It tells a story, self contained and full of a heart that the other games lack. It connects you to a world and the people in it. It asks more of you. It trusts you to care. It’s an absolute achievement. If ignored my spoiler wanting and are someone who hasn’t played it, don’t wait. If you have, play it again. BioShock has never been better than this.